To get an Independent elected in Dickson I NEED YOUR FUNDING SUPPORT. Any amount will assist to make that happen. In 15 years what has Peter Dutton really done for the people of Dickson? Unlike him I am free to PUT DICKSON FIRST! With Dickson being a key battleground seat, I say 'It's TIME' that the Sovereign Will of the Voters of Dickson is faithfully represented in the People's House by an Independent who pledges to represent what the majority of voters really want. My name is Thor Prohaska and I believe that elected representatives should represent what the majority in the electorate want. Not what the representative wants, or a party wants and especially not what the faceless donors want. I was born in Collinsville North Queensland and I am a 5th generation Australian of English, Irish & Moravian heritage. I have lived in the electorate of Dickson since 2003. I'm married with 4 children. I have worked in the public & private sectors, I've run my own businesses and I was a pioneer of the sport of snowboarding in Australia. Click here for more details about me. Dickson is one of the most marginal electorates in the country and it is in the spotlight this election. I hear Peter Dutton is said to be the leader of the conservative wing of the Coalition, pulling our politics further to the right on issues of national importance. It's obviously no easy task unseating a cabinet minister, but according to experts Peter Dutton is VULNERABLE. Whether Mr Dutton as Immigration Minister really supports the indefinite detention of asylum seekers in the appalling conditions of the offshore detention centres is irrelevant because in the end it’s his actions at the direction of his party that are resulting in this disgraceful situation which is a stain on our national character. Of course we need to protect the security of our borders but locking people up and throwing away the key is NOT REQUIRED TO ACHIEVE THAT! ! It also ignores all our international treaty obligations, a point not missed by our allies who can only view this as a shoddy Treaty Commitment at best. Liberal and Labor have buckets of cash to splash from their dodgy donors to keep asylum seeker policy unchanged because they cynically see votes in it. 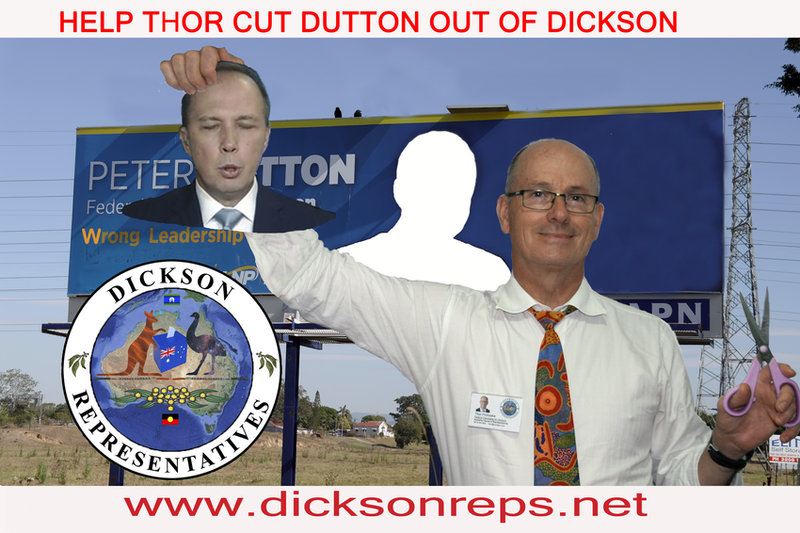 To take on and beat Peter Dutton in Dickson I need the help of all the people in Australia who want to see Peter Dutton SENT BACK TO WHERE HE CAME FROM. This will send a clear message to the parties that they IGNORE THE SOVEREIGN WILL of the electors AT THEIR PERIL! Labor, the Greens & any other party can't represent the people of Dickson because they all put their party & donors before the voters. In short there are no other contenders besides an Independent candidate who can pull this off. * Run advertisements across print, radio & tv. * Setup a campaign office. * Support volunteers to run community events. * How To Vote cards. All this needs resources. So please contribute to my Crowd Funding campaign to give me the resources I need to cut through in Dickson. If elected I will be the first Independent to defeat a sitting cabinet minister. This, I believe, will also open the door to fixing what is broken in our precious democracy. Even if you can only spare a few dollars it will all help and be greatly appreciated. WITHOUT YOUR HELP it is as good as guaranteed that a PARTY PUPPET WILL AGAIN BE ELECTED IN DICKSON and the arrogance of the Party Manipulators will continue to damage our nation.